It’s amazing to think how far God has brought Bible translation in a short time. Six centuries ago, John Wycliffe—our organization’s namesake—sat by candlelight writing his English translation of the Scriptures by hand. The thought of doing that for every language in the world would have seemed crazy. Fast forward to the 21st century. I’m sitting in a circle with a team of national Bible translators in the Middle East. Most of them are middle-aged men, dressed in traditional garb. And each of them has just received a computer tablet with custom-designed translation software. They’re not sure what to make of the little devices they hold in their hands. “Is this real?” one of them asks. “Is it a toy?” another one queries. Meanwhile, the youngest member of the group has already opened his tablet, accessed the translation app, and is eagerly scrolling through it. He understands intuitively how to use it. It’s just like the smartphone in his pocket, which he uses all day every day. Before long, he’s showing his fellow translators how it works. Soon they catch on and see the tablet’s power to help them translate the Bible swiftly and discreetly. I’ve decided to call him “Barnabas” (Son of Encouragement)—because he’s such an encouraging presence in the group. Not long ago, Barnabas was a terrorist. Then he heard the gospel—and everything changed. Now he’s working with a team of translators to bring the Bible to his people in their own language. This is how Bible translation gets done in the 21st century! And it’s accelerating—like never before. Now, imagine this scenario multiplying dozens of times. That’s the idea behind our #100Tablets1Day project. Each tablet we supply will equip another team, enabling them to translate, collaborate, and store their work for later revisions. They’ll be able to work discreetly, without attracting attention from people who oppose the Gospel. It’s a revolutionary shift in Bible translation. And it gives you an unprecedented opportunity to advance the Word of God in the world. With your support, we can provide one of these tablets to a team of translators for just $300. But our vision is broader than that. You see, we’ve received an urgent request from the people we work with in the field. They’re hoping to start 50 new Bible translations before the end of this year. They’re getting requests from people who’ve heard about what God has done for their neighbors. And now they want the Bible for themselves—in their own heart language. How can we deny a request like this? Of course, we said yes. And now we’re trusting God to make it happen. We’re hoping to provide 100 of these tablets to facilitate Bible translation for more teams around the world. That means we need to raise $30,000 today. Please prayerfully consider what your role will be in this great adventure. 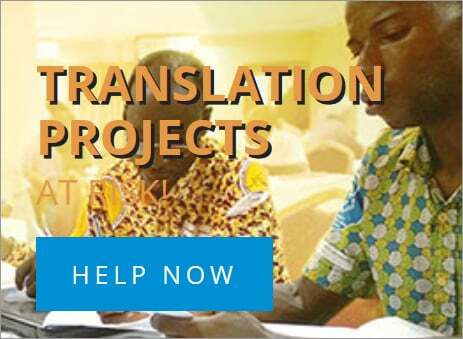 And then give whatever you can to help provide 100 tablets for national translators—today!